Although about 370,000 acres of farmland in the Lower Mississippi Alluvial Valley (LMAV) have been planted in bottomland hardwoods over the last decade, more than 90 percent of the planted sites have not performed well, failing to meet the criterion of 100 woody stems per acre. Attributing these failures to lack of information on how to analyze site conditions and overcome difficult conditions, SRS researchers provided the following guidelines based on research at the SRS Center for Bottomland Hardwoods Research in Stoneville, MS. The former agricultural areas you are considering for afforestation are more than likely low and wet. Tree seedlings are damaged or killed by sitting for long periods in soil saturated by standing or flowing water, and by high water levels that cover them during the growing season. These conditions need to be kept in mind when beginning afforestation efforts. Before choosing which trees to plant, get at least a 5-year history of flooding on the site from the landowner or farm manager. Tree species can be planted in less frequently flooded conditions than they can tolerate, but not vice versa. For example, baldcypress, a water-tolerant species, can survive on a ridge, but cherrybark oak, which has low tolerance for flooding, should never be planted in a slough. The best strategy is to plant the species adapted to the worst flooding conditions. It may be possible to control flooding until seedlings get tall enough to survive by building reservoirs or constructed wetlands. Bare-root seedlings should be dormant when planted, which means December to March in the LMAV. Some sites are under water during this period; avoid flooded conditions if possible. Waiting to plant after spring floods recede is desirable, but planting bare-root stock in June is risky. Research has shown that container stock can be successfully planted into late summer—but it is expensive. The average cost for a bare-root seedling in 2004 was $0.20 to $0.30 for a range of hardwoods, inexpensive when compared to large ontainer seedlings (5 to 6 feet tall) at $6.00 each. A tree seedling planted in standing water will shed its existing root system and develop another one more adapted for life in standing water. When planting in standing water, heavily root-prune the seedling and insert it into the soil without digging a hole. Successfully growing bottomland hardwoods depends on the physical condition of the soil, moisture and nutrient availability, and aeration. Oaks, the most popular trees for afforestation, grow best on moist, well-drained sites with good fertility and soils of medium texture. Unfortunately, most of the soils in the LMAV are heavy clay. Soil chemistry, indicated by pH levels, can also be a problem, as can traffic pans (compacted areas formed by repeated passes of farm equipment) on former agricultural fields. Determine if the site is minimally acceptable for a tree species by testing the pH of the soil and using productivity tables available from forest extension agents. Planting trees in former agricultural land requires disking at least twice with a heavy disk in late summer or early fall at a depth of 8 inches, preferably 15 inches. Deeper plowing or ripping is recommended for sites with heavy traffic pans. Site preparation for cottonwoods is more intensive, requiring double disking and ripping. Agricultural soils in the LMAV have lower organic matter content and may be depleted of nitrogen. Fertilize highnitrogen- demanding species such as cottonwood at the time of planting. Fertilization may stimulate weed growth, but the resulting early height growth may also reduce risk from flooding. Few guidelines are available for fertilizing hardwoods. Even under the best of conditions, tree seedlings have to compete with weeds—both vegetation native to the site and nonnative invasive plants—which take advantage of disturbance to spread. Woody vines, either native or nonnative, are a particular problem. Problem plants must be taken care of before planting hardwoods, since it is virtually impossible to control after planting without harming the trees. It has been a common practice to plant tree seedlings without any site preparation after the agricultural crop has been harvested, or to disk once on fallow sites. Disking has been shown to significantly improve the survival and growth of hardwood seedlings. Mowing is totally ineffective for reducing competing vegetation before planting. Research has shown that applying herbicides in old fields with “normal” weeds improved the survival of oaks by as much as 25 percent. In fields with woody vines and nonnative invasive plants, effective control before planting will probably determine the success or failure of the restoration effort. For specific controls, start with Jim Miller’s, Nonnative Invasive Plants of Southern Forests: A Field Guide for Identification and Control, available online at http://www.invasive.org/eastern/srs/. Plant-eating animals such as beavers, nutria, and white-tail deer can dramatically affect the survival and growth of bottomland hardwood seedlings. Small mammals such as rodents and rabbits are often responsible for failures of directly seeded plantings. Fencing a 10-acre site with 8-foot-high tensile deer fence with 2-foot-high poultry wire at the base to exclude rabbits was estimated to cost $1,470 or more in 2001. Flooding makes electric fencing impractical. Double-wall plastic tree shelters—tubes placed around young seedlings—have been shown to reduce animal predation, stimulate growth, and increase seedling survival. In large restoration areas, shelters may not be cost effective. They are relatively expensive, and are easily knocked down and swept away by floods. On most sites, controlling the herbaceous vegetation removes the cover for small mammals and reduces their effect on seedlings. These guidelines were excerpted from: Stanturf, J.A. ; Conner, W.H. ; Gardiner, E.S. ; Schweitzer, C.J. ; Ezell, A.W. 2004. 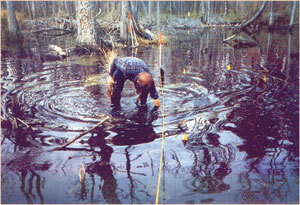 Recognizing and overcoming difficult site conditions for afforestation of bottomland hardwoods. Ecological Restoration. 22(3): 183-193. Available in full text, or the article can be ordered from SRS. The article includes a waterlogging tolerance-rating table for common tree species of the Southern United States, and a table to help landowners establish waterlogging tolerance classes for their land based on flooding duration and season. The two can be used together to roughly determine the species to plant on a site where the flooding history is known.